2)Specialized Hospital for Active Treatment in Cardiology, Veliko Tarnovo, Bulgaria. The paper presents results of investigation of life significant events experience, in individuals diagnosed with prehypertension to prove the connection between the individual significance level of each event and elevation of blood pressure, compared with people of the same age groups, but without elevated blood pressure. The table of Holmes and Rahe (1967) for significant life events has been used in order to prove this assertion. The results show that patients with prehypertension went through significant life events during the last five years and have emotional charge with double strength compared to those with normal blood pressure. They insist on functioning at an optimal level of their physical and psychic energy and experience every change stressfully even in the positive emotional aspect. Key words: prehypertension, vitally important events, experience, stress. Please cite this article as: Boncheva I, Misheva A. Experience of significant life events in individuals diagnosed with prehypertension. J of IMAB. 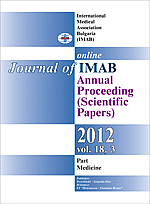 2012; 18(3):327-329. doi: 10.5272/jimab.2012183.327. 2. Оrbetzova M, Nikolov F. Metabolic syndrome and hypertension, Medinfo. 2011. 6. Holmes TH, Rahe RH. The social readjustment scale. JPSoR, 11, 1967, 312-318.